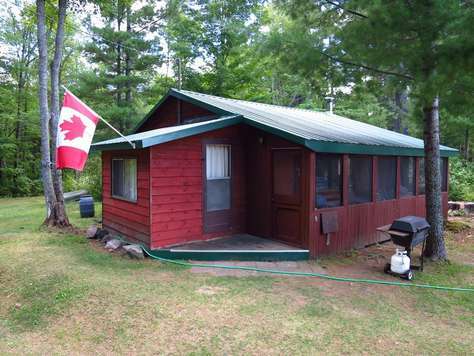 4 Bedroom cottage on Gull Lake. Cottage includes BRAND NEW KITCHEN, EATING AREA AND LIVINGROOM AS WELL AS A NEW DOCK. . A large screened deck overlooks the lake and provides a wonderful outdoor dining area. A sun filled living room is comfortably furnished with futon couches. The kitchen has convenient access to the outdoor dining area. Four bright airy bedrooms. Sit out in the afternoon sunshine on the shoreline dock, or go for a swim in the clear waters of Gull Lake. Shallow, sheltered child friendly, sandy beach area. Clean, clear waterfront, perfect for swimming. Large, westward facing dock, perfect for relaxing. Renters can launch their own boat from a public boat launch minutes away in Coxvale. Enjoy the kayak and paddle boat on the waters of Gull Lake. Get out the guitar and have an evening of music by the waterside firepit accompanied by the whispering of a gentle breeze in the pines. 26" flat screen TV with DVD, Hunters creek golf and petting zoo (hwy 41 and 506). Don't miss out on this cute, cozy cottage for the 2018 summer season! Great price with all the amenities. PRICED AT $995.00 PER WEEK! BRAND NEW DECK, NEW FLOORING IN MAIN LIVING AREA. Short drive off main road and only a few hundred yards from boat launch. Lakeside dock, good fishing with an abundance of bass and pickerel. Fire pit for those well liked marshmallow roasts. Large deck overlooking water where the barbeque is located. Kitchen is fully equipped. TV is also available but a Bell receiver is required. Enjoy taking the canoe out on beautiful Malcolm Lake. Down a winding lane, come upon a secluded cottage on a perfect piece of land. If you’re looking for privacy and a beautiful lake for swimming, fishing, boating or just relaxing – you’ve arrived at the right place. This cottage has a long history, built by grandfather, passed to daughter and recently taken on by grandson. A screened sun-room looks out over the lake and 3 bedrooms accommodate family and friends. A rustic wood interior houses kitchen and living room. Launch your boat right here and moor it to the dock. Play catch or some lawn games – there’s plenty of land. And when the day is done, gather on the porch and enjoy the evening breeze rustling in the trees and the spectacular sunset across the bay. 640 sq.ft., with screened sun-room 125 sq. ft, 1 bathroom, 3 Bedrooms (2 double & 1 single with 1 single bunk bed) Sleeps 7 plus a fold out couch sleeps 1 adult or 2 small kids. 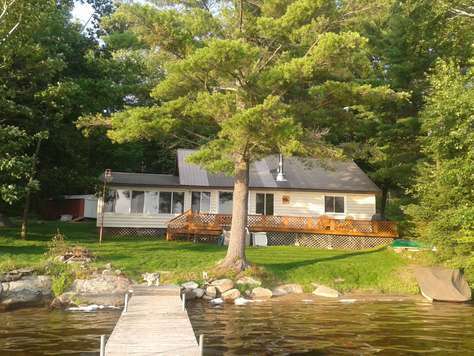 Located on a quiet bay on pristine Skootamatta Lake, this 3 bedroom family cottage has a waterfront sand beach, shallow water, and great swimming area. 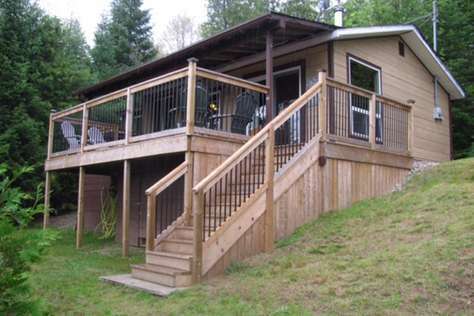 A large deck overlooks waterfront, with full view of water from inside cottage and deck. Sleeps 6, 2 bedrooms with queen beds and a sleeping loft with 1 single & 1 double bed. Large kitchen with combined living room and dining room with adjacent sunroom.. Comes with paddle boat and canoe for exploring lake. 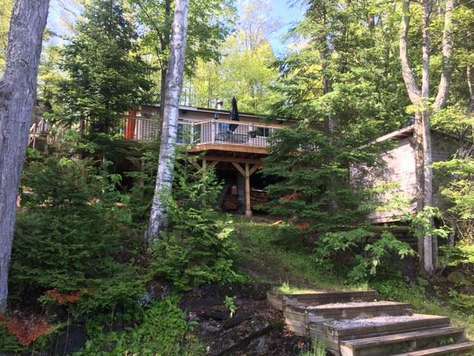 On a private road, this cottage is very accessible with no stairs on a level lot to the waterfront. Full sun for afternoon on waterfront and beautiful sunsets. Excellent fishing and boat cruising lake. 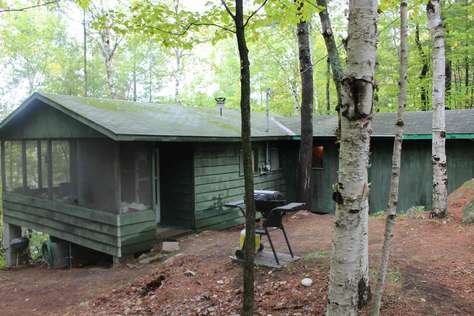 3 Bedroom traditional lakefront cottage in quiet bay facing South. Don't miss out on this cute, cozy cottage for the 2018 summer season! Great price with all the amenities. Short drive off main road and only a few hundred yards from boat launch. Lakeside dock great for swimming or fishing. Fire pit for those those who like a nice campfire in the evenings. Look out for loons during the day. Large deck overlooking the water with a barbecue. Kitchen is fully equipped. TV is also available but a Bell receiver is required. Enjoy taking the canoe or paddle boat out on beautiful Malcolm Lake. Unique opportunity to experience one of Pine Lakes's original cottages. Enjoy breakfast with the birds on the screened in porch and stunning sunsets from the 20 foot dock. Loaded with games and books for quiet afternoons. 143' of shoreline, western exposure, perfect for swimming, fishing and canoeing. Easy drive to Plevna and Sharbot Lake, and a bit farther to Perth. Welcome to the cottage lovingly named "Stairway to Heaven". Whether you're walking up to the cottage or down to the lake all directions point to heaven. 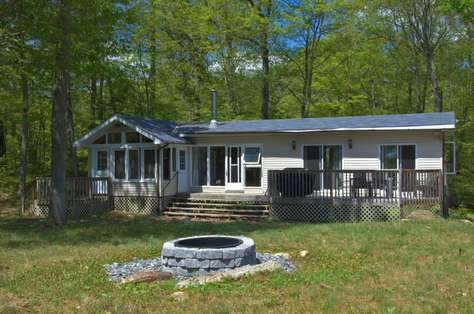 2 Bedroom Cottage on a beautiful 2 acres of private forested property. Sleeps 6 people. 1 Queen Bed, 2 Twin bunk beds and a comfortable, modern Queen sized pull out sofa. Bring your own linens. The cottage sits nestled on a hill overlooking beautiful Bob's Lake just a short walk down to the peaceful waterfront where you can enjoy a leisurely day reading a book, swimming or fishing right off the dock. (Bob's Lake is known for great fishing). Up at the cottage, enjoy the sounds of nature while you sunbathe in privacy with no neighbours in view. At night, enjoy a campfire in one of the two fire pits located up by the cottage or down by the moonlit lake. When it comes time to cook there's a full kitchen with breakfast bar or table to sit at or enjoy the sunshine while cooking with the propane barbecue on the deck. Groceries, LCBO and other services are only a short drive away in Sharbot Lake or the beautiful town of Westport. Whether you're a family or a couple looking for a romantic week at the lake to get away from the hustle and bustle of city life, this is the place memories are made. BRAND NEW TO OUR INVENTORY! Land O’ Lakes paradise. This private retreat is nestled among the trees with breathtaking views of Kashwakamak Lake. Soak up the sun all day on the large south-east facing deck or dock. This updated cottage is on a private dead-end road that leads to the 2+ acre property. The 150 foot clear waterfront sits on the calm waters of Browns Bay and offers a 16’ x16’ dock that is great for swimming, fishing and lounging. The water is approximately 8 feet deep off the end of the dock, has a sand/rock bottom and is free of weeds. There is also a canoe that can be used to explore the cliffs and views on this 18 km lake. In addition, you can enjoy a day adventure to BonEcho Provincial Park (Mazinaw Lake), the local golf course or the petting zoo/sanctuary, all within a 15 minute drive. The inside of the cottage is updated and offers modern amenities such as satellite TV, DVD player, leather furniture, stainless appliances…and yes it has a dishwasher. The 2 bedrooms offer sleeping for 5 and are cozy with closets for storage. The bright, airy open concept space offers a large updated 4 piece bathroom, vaulted ceilings and a tastefully decorated family and dining room that extend off the kitchen. You will not be disappointed by this cottage if you are seeking a calm and quiet lake that offers spectacular views from the canopy of mature trees.